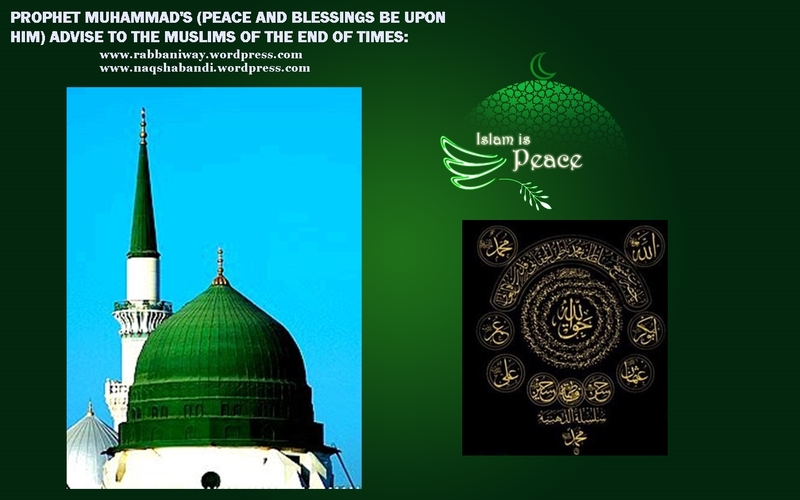 GREATEST ADVISE OF PROPHET MUHAMMAD (S.A.W) TO PEOPLE OF THE END OF TIMES! In the End of times (this times) Dajjal-Anti Christ and his followers commit crimes, injustice oppression and tyranny in the name of Islam. So this period is known as as the period of great trials and tribulations that is coming against Islam and Muslims in all means. This is the reason, the Prophet of Allah (Nabi Muhammad alaihiswalathu wa salam) advising Muslims to stay away from all this groups and sects that make confusion and mischief in the name of Islam. The forces of Anti-Christ want to oppress whole world and put the blame on Islam and Muslims. So the dark powers have elected people from all religious groups and sects that want to spread atrocities throughout the world, among Muslims Christians and other faiths, then to put the label of “Islam” for the horrible crimes they are committing. Abu Huraira (R.A) reported Allah’s Apostle (may peace be upon him) as saying: There would be turmoil and the one who would sleep would be better than who would be awake and the one who would be awake would be better than one who would stand and one who would stand would be better than one who would run. So he who finds refuge or shelter should take that refuge or shelter. THE PEOPLE OF DAJJAL AMONG MUSLIMS SAY: “DO NOT FOLLOW AMIR OR IMAM JUST FOLLOW ONLY BOOKS”!!! Know that everything that you are busy with is going to end up in afflictions other than it is for the sake of Allah and His Prophet (s.a.w), because in this days, there is no ruling according to the Quran and Sunnah of Prophet (alaihiswalathu wa salam). So it is obligatory for Muslims to stay away from all this groups and sects that call you to streets and cities. You have seen, many orthodox Jews does not mix with others, they do not go into streets much. They stay away and remain busy with what concern them. Because they know it is not a wise thing to expose themselves to this afflictions. Do not run to join different political and religious groups that are busy with fighting each other and boasting about their false hood. They are not tightly holding to the Book of Allah and Traditions of the Prophet Muhammad (alaihiswalathu wa salam). Stay with people of Zikr (People of Tariqah) and Sohbet (association of spiritual seekers), this is the only place where you find peace,safety and tranquility. If you follow this advise of the Messenger of Allah (peace and blessings of Allah be upon him), then you will be successful in this world and hereafter. Whoever disobey the Messenger of Allah (alaihiswalathu wa salam), they will be losers in this world and hereafter. So Allah Says: [Quran 24:63]…So let those beware who dissent from the Prophet’s order, lest fitnah strike them or a painful punishment. The Prophet (s.a.w) is advising for your own benefit in this world and hereafter. So be among intelligent ones. Do not be among foolish people. Do not be among hypocrites , who chose to love some and hate some, for example some people love Imam Hussain (R.A) and hate Shaykh Abdul Qadir Jilani (Q.S), or others. Some people love so and so ahlul baith and hate so and so ahlul bayth. This is sufficient for wise people to listen to and to obey. Religion is to “Listen and Obey”, not to listen and abandon, nor to ignore.